Every business produces confidential data. Customers lists, price lists, sales statistics, drafts of bids and correspondence, and memos are all examples of confidential data. All businesses also possess other people’s confidential data which is their legal responsibility to protect. These documents include employee records and personal information. Unless proper precautions are taken, important information could end up in the dumpster where it is readily, and legally, available to anybody. It is said that your garbage is the single most available source of competitive and private information. By not destroying private and proprietary data, a company may be subjecting itself to not only the risk of loss of business, but it may also be exposing itself to criminal and civil prosecution. If not controlled; everyday trash of every business will contain information that could be harmful to their operation and beneficial to their competitor. Discarded daily records such as: phone messages, memos, misprinted forms, drafts of bids and drafts of correspondence are especially dangerous because they contain current information that could be useful to a competitor today. Every business is vulnerable because of their need to discard these types of documents. The only way to minimizing this type of risk is to make sure such information is securely collected and destroyed. 1. Secure 64 gallon toters with locks are supplied for the secure storage of confidential documents. 2. Only authorized HSR Services staff has possession of the key to the toters. 3. Bins are only unlocked at the time the contents are to be shredded, and not before. 4. Shredding is done in-house by trained employees under supervision using our industrial paper shredder. 5. Date of destruction is recorded. One copy of this record is sent to the company and one is kept on file for a period of six months. 6. All shredded documents are sent in bulk to a paper broker where it is then baled and sold as paper fiber. 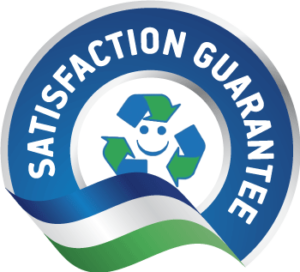 Let us know how we can make your document destruction easier.